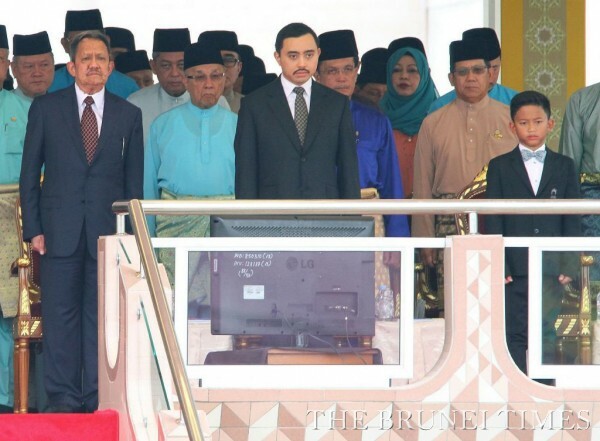 MORE than 30,000 patriots filled downtown Bandar yesterday as the country celebrated Brunei’s 32nd National Day at Taman Hj Sir Muda Omar ‘Ali Saifuddien (SOAS). 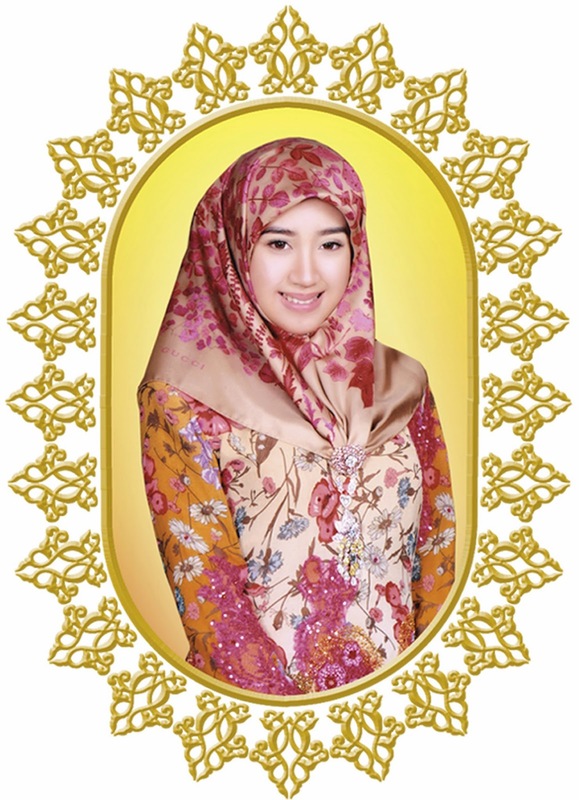 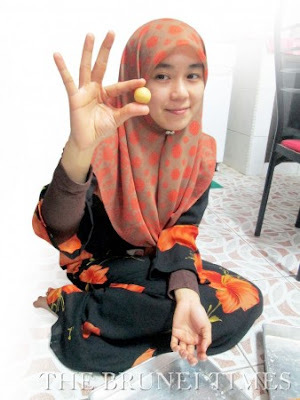 As early as 6am, people from all walks of life slowly streamed into the historic padang – where Brunei was declared an independent nation on January 1, 1984 – as the focal point for nationwide celebrations. 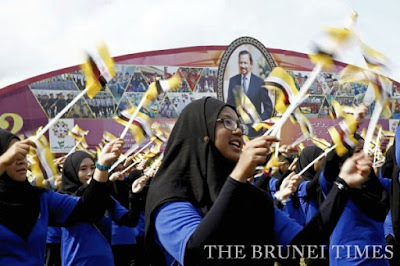 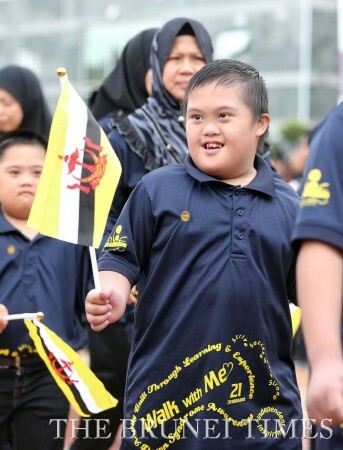 Students lined the streets leading to the capital – some armed with flags, others with the traditional hadrah drum – eagerly anticipating the arrival of His Majesty Sultan Haji Hassanal Bolkiah Mu’izzaddin Waddaulah, the Sultan and Yang Di-Pertuan of Brunei Darussalam. 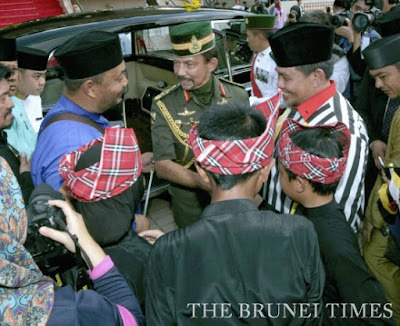 The monarch rolled up in his ceremonial black Rolls Royce, accompanied by several members of the royal family, including His Royal Highness Prince Hj Al-Muhtadee Billah, the Crown Prince and Senior Minister at the Prime Minister’s Office; HRH Prince Hj Sufri Bolkiah; HRH Prince Hj Jefri Bolkiah; HRH Prince ‘Abdul Malik; HRH Prince ‘Abdul Mateen and HRH Prince ‘Abdul Wakeel. 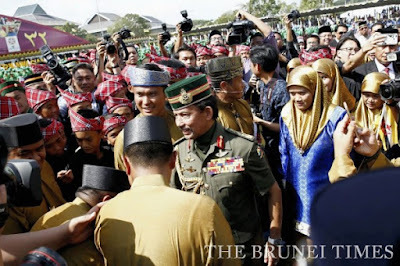 Dressed in the khaki green uniform of the Supreme Commander of the Royal Brunei Armed Forces, His Majesty saluted as the national anthem, Allah Peliharakan Sultan (Allah Bless His Majesty), echoed across the field with citizens standing in recognition of king and country. 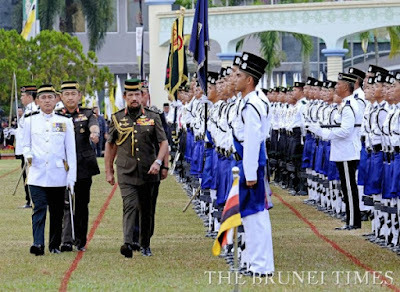 The Sultan then descended the royal dais to inspect the guard of honour, mounted by members of the Royal Brunei Armed Forces (RBAF) and Royal Brunei Police Force (RBPF). 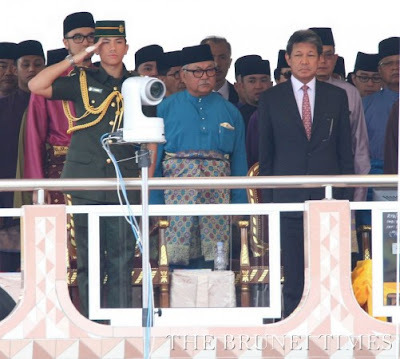 Senior government officials, foreign envoys, and other invited guests took their seats in the grandstand to watch the annual march past of uniformed personnel, government agencies, schools, non-profit organisations and community associations. 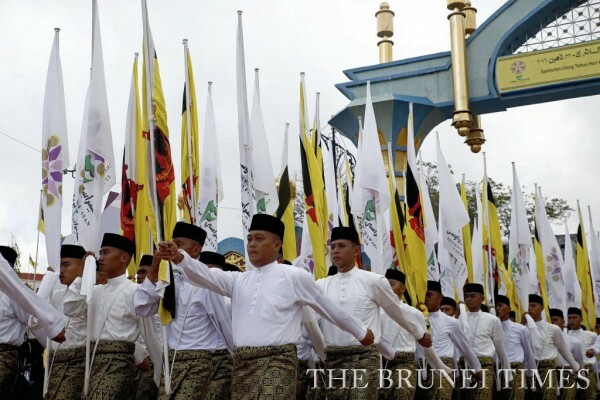 This year’s procession included 126 groups totalling 21,000 people. The parade kicked off as 32 national flag-bearers, donning crisp white baju cara Melayu, proudly bore the weight of the giant flag into Taman SOAS. 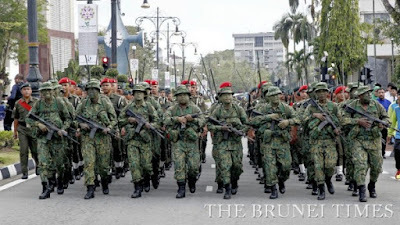 The RBAF then followed with an impressive display of weaponry and keen military timing as they walked in unison circling the padang. 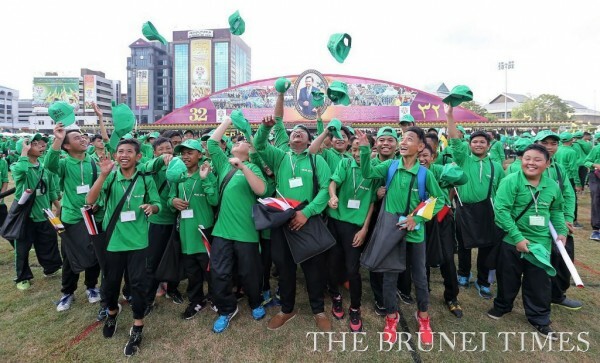 Media and photography enthusiasts flanked either side of the field, vying to get the perfect shot as the assembled groups, dressed in their finest, marched into the taman. 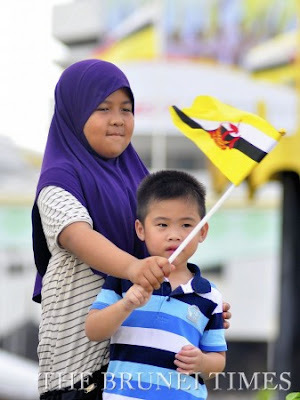 The monarch stood for almost two hours as the procession of 21,000 people flowed past, honouring their spirited display of patriotism. At the end of the march past, the crowd fell silent as Hj Abdul Hafiz Hj Md Daud, a government finance officer, led the public in reciting the national day pledge. 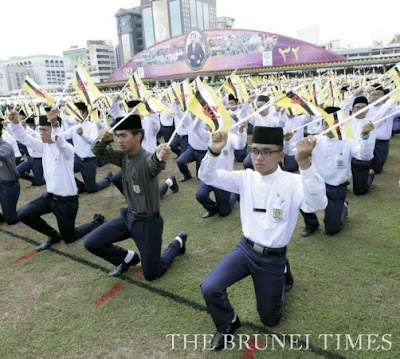 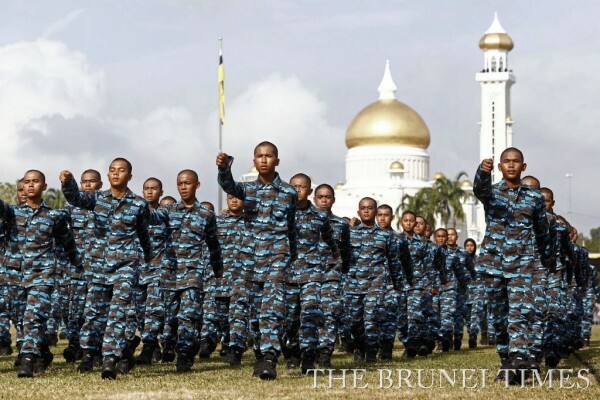 He told The Brunei Times that he was selected from hundreds of participants to be the chief oath reader. The two-hour event concluded with a sharp performance by the National Silat Association, followed by a colourful song-and-dance number by some 6,800 field performers. 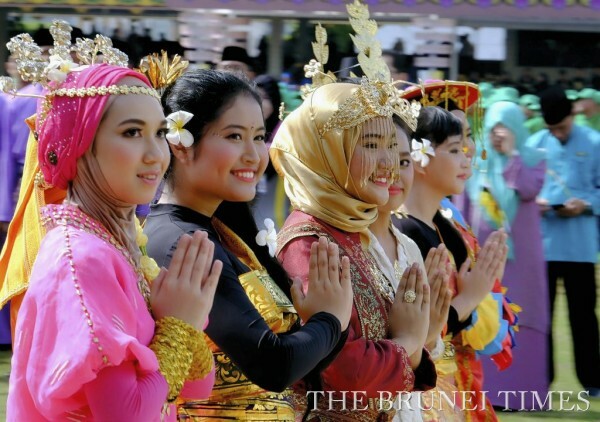 The crowd encouraged and applauded the performers as they danced their way through the intense mid-morning heat, with several participants fainting due to dehydration. 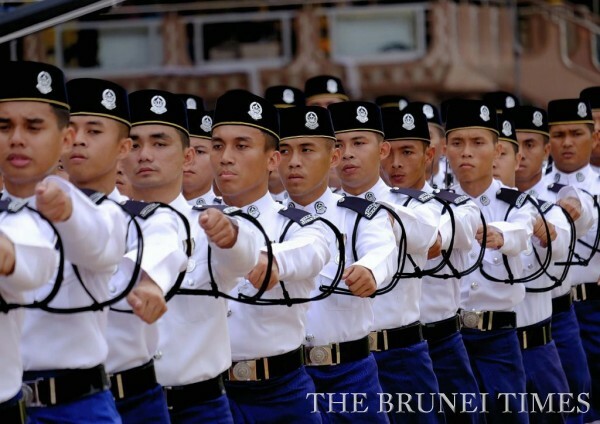 Medical personnel were on hand to carry them off to the mobile clinics stationed outside Taman SOAS. 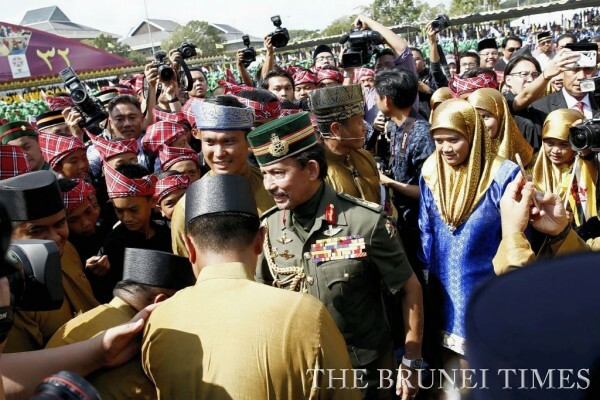 As the celebrations wound down, His Majesty made his way down to the field, taking the time to congratulate and thank the field participants before he left. 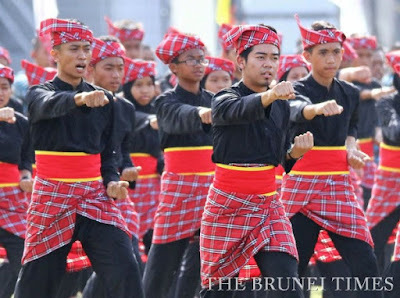 Minister of Culture, Youth and Sports Yang Berhormat Pehin Datu Lailaraja Major General (Rtd) Dato Paduka Seri Hj Awang Halbi Hj Mohd Yusof, said the theme of this year’s celebrations – Generasi Berwawasan (Visionary Generation) – reflected the dedication and hard work of all the participants.